Have you been wondering what the best pillow is to relieve neck pain? Ask experts in the field such as orthopedic doctors, doctors of chiropractic or physical therapists and you will hear recommendations for a “supportive “pillow to supplement treatment for reducing neck pain. There are terms referring to neck pillow support that are helpful to know. Cervical – Cervical in this context is the anatomical name of the neck which includes spinal bones 1 through 7. Orthopedic – Orthopedic is a medical term which relates to the correction of deformities of muscle and bones. The best pillow helps alleviate neck pain and correctly aligns the spine. It supports the neck in its natural position. A study completed in 2014 investigated the effect of different pillow shape, content on cervical curve, pillow temperature, and pillow comfort (1). They found comparing orthopedic, memory and feather pillow that the orthopedic pillow allowed for the best in support, maintaining temperature and scored the highest in comfort. A healthy neck has ideally a “C” shaped curve. 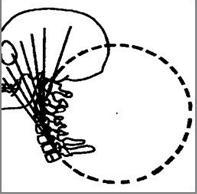 According to the Harrison Spinal Model created by Dr. Don Harrison an ideal cervical spine has a geometric shape that approximates a ‘piece of a circle’ or “C” shape (2). A pillow to support this shape is preferred over a pillow that puts pressure on the neck and head. A 2016 study revealed that a pillow that increases the elevation of your head 60mm while lying on your back can increase cranio-cervical pressure and adversely affect neck alignment by 30% (3). There are only a three components to consider with orthopedic pillows that help with neck pain. The size is based on your preference. A larger pillow may not fit in your pillow case or it could take up to much space. Most orthopedic pillows makers offer a variety firmness options. Materials will range from organic cotton to non-organic polyester mix. Choose material that matches your needs. Choose a 100% cotton content and fabric if you are sensitive to polyester mixes. The best pillow for neck pain will be one that offers the best in support of the c-shape curve of your neck, maintains temperature and is comfortable. The orthopedic pillow does all these things. Select a orthopedic pillow that fits your preferences in size, firmness and material. (2) Harrison DD, Harrison DE, Janik TJ, Cailliet R, Haas JW, Ferrantelli J, Holland B. Modeling of the Sagittal Cervical Spine as a Method to Discriminate Hypo-Lordosis: Results of Elliptical and Circular Modeling in 72 Asymptomatic Subjects, 52 Acute Neck Pain Subjects, and 70 Chronic Neck Pain Subjects. Spine 2004; 29:2485-2492.